The Northampton Area Historical Society took residents on a journey through the borough’s past during a “looking back” presentation on Saturday, March 10. The council chambers of the Northampton Borough Hall were filled with area residents sharing stories, recalling memories, and uncovering new details about the borough’s rich history. The historical society’s vice president, Larry Oberly, led the presentation, which used images both new and old to tell the story of over 60 borough businesses, past and present. “To me, history has always been a chronical of change,” Oberly said. Oberly and other members of the historical society, including Terry Reppert, combed through Ray Walls’s 1941 publication Northampton: The Town That Wants You, which listed over 241 businesses in the borough. Plumbers, electricians, butchers, taverns, drug stores, dentists, doctors’ offices, inns, and more lined the borough streets. “We are hard-pressed to get near that today,” Oberly said. However, Walls’s book did not list the addresses of the businesses or how long they were around, leading Oberly, Reppert, Edward Pany, and the rest of the historical society on a mission to shed some light on the borough’s past. They went through old photographs, Thanksgiving football game ads, church programs, and family histories to find where these businesses were and what became of them. Thousands of notecards were filled with addresses, names, and stories, while several flash drives were filled with pictures Pany provided of businesses gone by. Several pictures showed the farms and meat markets of J.H. Kleppinger. In the 1890s, the butcher delivered fresh meat to the borough via horse and wagon. Meanwhile, plenty of pictures showed an abundance of taverns and hotels. “We never had a shortage of bars, taverns, or hotels,” said Oberly. He cites the cement industry as a reason for this. After a hard day’s work, plenty of employees frequented the local taverns to wash the dry cement dust out of their throats. 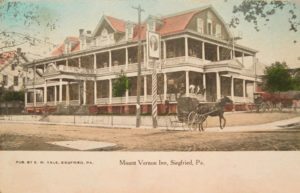 An ad for the Rosendale Hotel, which was once in the borough, marketed stable accommodations and the “best liquors.” Meanwhile, the grand Mount Vernon Inn sat at 21st and Main Streets and the Allen House sat where Assante Restaurant now stands. At 10th and Main, the American House once stood. It was here that President Teddy Roosevelt stayed when he visited Northampton to sign a contract with Atlas Cement to help build the Panama Canal. Oberly, who was a member of the fire department when the hotel started on fire in the mid-twentieth century, recalled having to save the historic hotel’s ledger, where Roosevelt’s name was signed. Next to where the Roxy now stands was Miller’s Department Store. With four floors above ground and one below, the department store was a popular stop for area residents. As Oberly explained, Miller’s owned the building where the Roxy now stands and sold it to the owner of the 80-seat Lyric Theatre across the street so the theatre could expand. When the Lyric was sold, the name was changed to the Roxy as an ode to the biggest movie theatre in New York City. 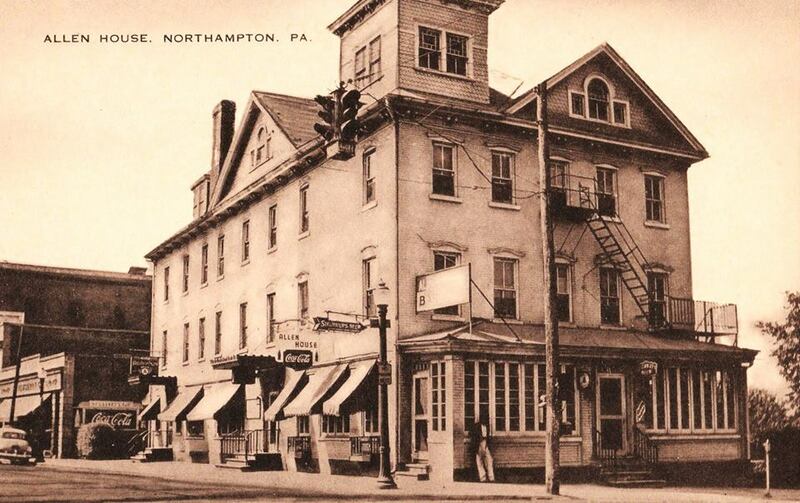 In addition to Miller’s, Northampton was home to a variety of other businesses, including the Laubachsville General Store, which was the largest general store in the area. 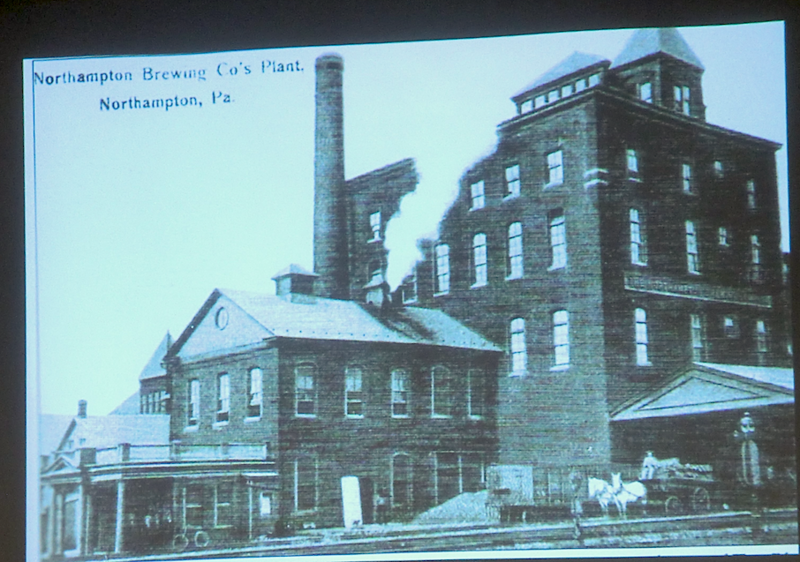 Meanwhile, the Northampton Brewing Company, the building of which still stands today, made three to four different beers, including Tru-Blu. The beer was transmitted to a bottling house across the street via underground pipes. The D&D Shirt Factory, the building of which also still stands on Newport Avenue, is now a senior living home. The building’s interior has been kept almost entirely authentic. While some buildings still stand and have been given a new purpose, others have been lost to time. The Odd Fellows building at 21st and Washington served a variety of purposes, from a taxicab service to an ice cream parlor to a dance academy. However, now a parking lot sits where the building once stood. One building that still stands is the Siegfried Train Station, home to the historical society. In the 19th century, livestock and cattle were delivered there, sometimes from as far away as Chicago. Livestock were led down Main Street to nearby farms. Many of the livestock ended up at Kleppinger’s butchers, bringing the economy and the history of Northampton full circle. Oberly and the historical society have thousands of other images of Northampton businesses and sites they are compiling. “[This is] just the tip of the iceberg,” said Oberly. The historical society is looking forward to having another presentation soon. In the meantime, the society is looking for area residents to help piece together the borough’s history. The society is asking residents to donate pictures, artifacts, and other memorabilia they may have of the Second Ward’s history for a display at their museum. The society’s ultimate goal, Oberly said, is to create walking tours through the borough so visitors can see how history has changed.